The Oracle Developer Community Appreciation Day is a day to thank the Oracle community by sharing technical knowledge or an Oracle user community experience. 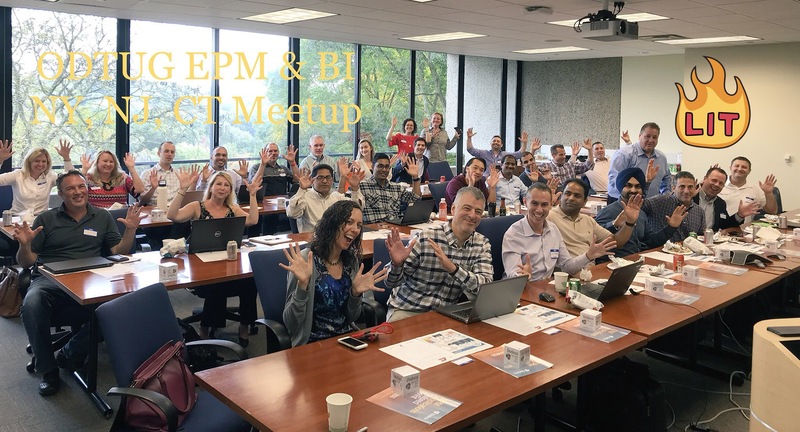 On Oct. 10, just one day ahead of ODC Appreciation Day, ODTUG hosted a very successful EPM & BI meetup in the Oracle offices in Stamford, CT. Since a picture is worth a thousand words, I’ll let you get a feel of the enriching 9 hour experience that 40 Oracle friends and colleagues had the chance to be a part of! I consider myself fortunate to have had the chance to present along with some very well known Oracle experts and most importantly get to meet new Oracle enthusiasts. Thank you Toufic Wakim for hosting the ODTUG #orclEPM #orclBI meetup at the Oracle Stamford, CT offices! Laura Ferris showcasing the Learning Paths for Oracle Cloud products – Al Marciante demoing #EPRCS & #SmartView new features – Rajesh Bhatia presenting #FCCS & cloud innovations! In Oracle Meetups, ODTUGers always come for the content and stay for the fun! Networking late in the night! Making new friends & catching up with old ones! Shout out to all who attended our @ODTUG Meetup yesterday in CT. It was a great turnout with excellent content and lots of fun at the happy hour afterwards. Thanks to our @oracle hosts @twakim and to our sponsors @AppliedOLAP and @interRel. Looking forward to the next one. In the past year we have revived ODTUG Meetups in the NY, NJ, CT area. Here are some highlights from past Oracle Knowledge sharing events. Thank you Oracle experts for your willingness to always share the latest and most helpful content across our user community! It’s your day to be appreciated! Let’s continue bringing our user community together and sharing what we know! Here is an example of how ODTUG keeps that tradition strong and growing! Many other fellow Oracle enthusiasts are posting great content on ODC Appreciation Day. Discover them on Twitter with #ThanksODC !